WASHINGTON (AP) Trea Turner hit two homers, including his first career grand slam, and drove in eight runs to help the Washington Nationals rally from a nine-run deficit and defeat the Miami Marlins 14-12 in a wild slugfest Thursday night to end a five-game losing streak. Lauer (4-5) gave up seven hits, walked two and hit a batter, but only one of those baserunners managed to score in his first win in four starts. Brad Hand gave up an infield single, then struck out the next three in the ninth for his 24th save. The Diamondbacks fell to 1-6 in what will be a 10-game homestand and dropped into a virtual tie with the idle Los Angeles Dodgers for first place in the NL West. Arizona had been alone in first since June 8. Shelby Miller (0-3) was better in his third start coming off Tommy John surgery, but still got the loss, allowing five runs – three earned – and five hits in 5 1/3 innings. Arizona’s Ketel Marte hit a two-run homer off Matt Strahm in the eighth. 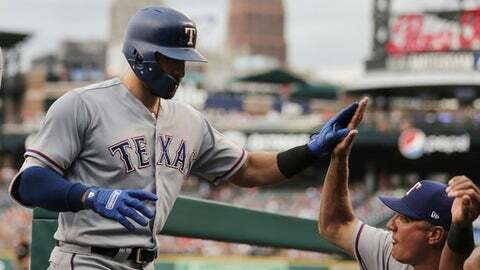 SEATTLE (AP) – Chris Herrmann hit his first home run for Seattle and Marco Gonzales pitched six solid innings to lead the Mariners past the Los Angeles Angels. Gonzales (9-5) gave up five hits while striking out seven in a 102-pitch outing. The lone run he gave up was Kole Calhoun’s sacrifice fly in the fourth inning to tie the game at 1. Edwin Diaz struck out the side in the ninth to lock up his major league-leading 34th save. Angels starter Jaime Barria (5-5) allowed two runs and five hits in 5 1/3 innings in the loss.